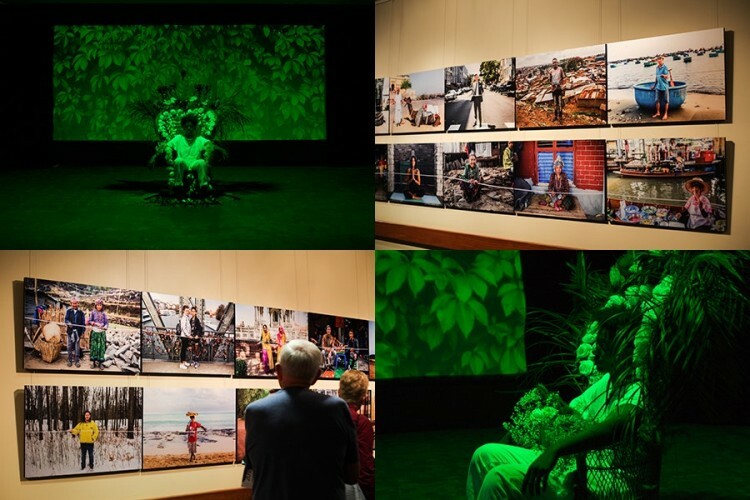 New Jersey-based Le’Andra LeSeur wins $200,000 Juried Grand Prize for powerful performance about identity and race; Indiana-based Chelsea Nix and Mariano Cortez win $200,000 Public Vote Grand Prize for portrait series about humanity’s connections. GRAND RAPIDS (Michigan) OCTOBER 5, 2018 — ArtPrize, the international art competition recognized as one of the world’s largest annual public art events, tonight held the Tenth Annual ArtPrize Awards Ceremony, powered by the DTE Energy Foundation, revealing the winners of $500,000 in prizes live on NBC affiliate, WOOD TV8. Rosa Parks Circle in downtown Grand Rapids was filled with event supporters, partners and collaborators to celebrate the artists who shared their work with hundreds of thousands of visitors during ArtPrize 10. Two $200,000 Grand Prizes were awarded, through smartphone-enabled public vote to THE STRING PROJECT by Chelsea Nix and Mariano Cortez, and by a jury of art experts to brown, carmine, and blue. by Le’Andra LeSeur. The entry that captured visitors’ imaginations and garnered the most votes was THE STRING PROJECT by Chelsea Nix and Mariano Cortez, a series of photographs taken across five continents that together represent humanity’s shared connection. Nix and Cortez’s took home the $200,000 Public Vote Grand Prize, presented by Meijer. The ArtPrize 10 Grand Prize Jurors — Brooke Davis Anderson, the Edna S. Tuttleman Director of the Museum at PAFA; Lauren Haynes, Curator of Contemporary Art, Crystal Bridges Museum of American Art; and Ran Ortner, artist and winner of ArtPrize 2009 — spent time in Grand Rapids viewing the juried finalist entries in the four entry categories, selected by an earlier group of jurors. They awarded the $200,000 Juried Grand Prize to Le’Andra LeSeur for her entry, brown, carmine, and blue. LeSeur utilizes visual media, installation and performance to make sense of the way current ideologies frame marginalized identities. “Le’Andra so compellingly utilizes all of her resources to take us into her world and her worldview. Her work was so deeply immersive. It’s about gender, it’s about race, it’s about America at its core,” said Davis Anderson. “What it means to be black, what it means to be a woman, what it means to be queer — they were all coming out in different ways in the work. And we were lucky enough to come around the time that she was performing,” said Haynes. “Together, the ArtPrize 10 grand prize winners reflect a shared sense of humanity. LeSeur’s brown, carmine, and blue. situated a remarkable series of endurance performance actions in a carefully appointed installation, confronting ideas of spectacle, trauma and race in a way that couldn’t be more timely, ” said Kevin Buist, ArtPrize Artistic Director. Public Vote*: THE STRING PROJECT by Chelsea Nix and Mariano Cortez (Fort Wayne, IN) at DeVos Place Convention Center. The Two-Dimensional Public Vote Award is presented by Edward Jones. Juried: PULSE Nightclub: 49 Elegies by John Gutoskey (Ann Arbor, MI) at Grand Rapids Art Museum. The Two-Dimensional Juried Award is presented by Western Michigan University. Public Vote: The Phoenix by Joe Butts (Oxford, MI) at Amway Grand Plaza Hotel. Juried: 108 Death Masks: A Communal Prayer for Peace and Justice by Nikesha Breeze (Taos, NM) at DeVos Place Convention Center. The Three-Dimensional Juried Award is presented by Haworth. Public Vote: Moving Experience by #shangled (Sparta, MI) at Grand Rapids Police Department. The Time-Based Public Vote Award is presented by DTE Energy Foundation. Juried*: brown, carmine, and blue. by Le'Andra LeSeur (Jersey City, NJ) at SITE:LAB. The Time-Based Juried Award is presented by X-Rite Pantone. Public Vote: Sonder by Megan Constance Altieri (Grand Rapids, MI) at Grand Rapids Public Museum. The Installation Public Vote Award is presented by Amway. Juried: Heidelbergology; 2+2=8 by Tyree Guyton Heidelberg Project (Detroit, MI) at SiTE:LAB . The Installation Juried Award is presented by KPMG. Since September 19, 32,613 visitors signed up to vote casting 253,161 votes across two rounds. The results of both rounds of the public vote were verified by a third party auditor. ArtPrize 10 venues will remain open through Sunday, October 7 at 6 p.m. ET. *When an entry wins both its category prize ($12,500) and a grand prize ($200,000), it receives the larger of the two prizes.